THE EUROPEAN COURT of Human Rights has rejected an appeal by the parents of a terminally ill baby that he should undergo experimental treatment in the US. Charlie, who is 11 months old, suffers from a rare genetic condition and has brain damage from which he will not recover. He is on a life support machine at Great Ormond Street Hospital (GOSH) in London. In its ruling, the ECHR noted: “In February 2017, the treating hospital sought a declaration from the domestic courts as to whether it would be lawful to withdraw artificial ventilation and provide Charlie with palliative care. “Charlie’s parents also asked the courts to consider whether it would be in the best interests of their son to undergo experimental treatment in the USA. In the proceedings before the ECHR, Charlie’s parents – Chris Gard and Connie Yates – argued a number of points, including that under Article 2 of the European Convention on Human Rights (right to life) the hospital had blocked access to treatment in the US and that, under Article 5 (right to liberty and security), he was being “unlawfully deprived of his liberty”. Yates told Sky News today’s decision is “upsetting“. A spokesperson for GOSH said: “Our thoughts are with Charlie’s parents on receipt of this news which we know will be very distressing for them. The ECHR noted the “sensitive” nature of the case, but in its ruling said: “The domestic court decisions had been meticulous, thorough and reviewed at three levels of jurisdiction with clear and extensive reasoning giving relevant and sufficient support for their conclusions. Email “Hospital in 'no rush' to turn off baby's life support machine after parents lose appeal”. 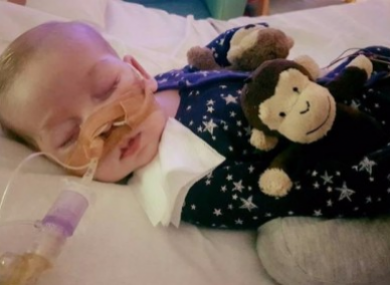 Feedback on “Hospital in 'no rush' to turn off baby's life support machine after parents lose appeal”.